Finding just the right adoption book for your child can be daunting. When my daughters –who are now 28 and 31 years old– were young, there were very few books from which to choose, and quite frankly, I found the content very narrow. For example, one book told how a mommy bunny placed her baby bunny for adoption due her not being able to care for her little baby bunny. Some parents felt the book presented mommy bunny needing to make an adoption decision based solely on her lack of financial resources. A woman’s lack of funds then begs the question, as pronounced by one little adoptee, “Mommy, why didn’t you just send my birth mother money?” While it is true that finances often play a factor in a women’s decision to make an adoption plan, there are many reasons why an expectant women and her partner may choose not to parent. 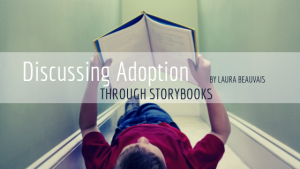 Addressing why an adoption plan is made is often avoided in adoption books. Some books just tell the joy of the adoptive parents and the child. Some topics, such as abuse and neglect, may be too delicate to overtly state in a book directed at the very young; while stories of Chinese adoptions must either tackle or avoid the issue of abandonment. With so many books from which to choose, how do you, as a parent, decide which ones are appropriate for your child and her particular situation and her age? Predicting how your child may react to a book can be complicated. First, you want to consider your child’s adoptive relationship with you. For example, your child may not be legally adopted by you. If your child is in a guardian or relative placement, then a book that discusses various family compositions, without mentioning adoption, may be appropriate, such as The Family Book by Todd Parr. If your child is or has been in foster care, you may want to read Murphy’s Three Homes: A Story for Children in Foster Care by Jan Levinson Gilman. To learn more about other books that address issues of loss, grief, shame, confusion, fear and attachment for children in foster care, visit this YouTube Review of Books for Children in Foster Care. For those who have adopted an infant, Tell Me Again About the Night I Was Born, by Jamie Lee Curtis, is a favorite. This book tells the story of the parents’ excitement of getting a call to receive their newborn infant. The focus is on the parents and the baby. It really could be a book about any baby entering a family—If only the mom had been in labor instead. It does not address adoption issues, and could be a first book for small children in which you with your child can begin the adoption discussion. Shaoey and Dot, by Mary Beth and Steven Curtis Chapman, is narrated by a ladybug who accompanies a baby abandoned in China who is then be placed in an orphanage, adopted, and then flown home with her parents. The ladybug shares its feelings and could be a springboard for discussing other strong and sensitive emotions with your child. There is a plethora of books available. So before you present a book to your child, read it first. Also, see what comments/reviews are written regarding the book. As noted, there are YouTube and other platforms to learn more about each book. Although many of the children’s books do not address serious topics, this does not mean your child is not thinking about his birth parents or why he was placed for adoption, abandoned, or removed from his birth parents. These are tough subjects, so make story time very special by creating a cozy and secure setting—free of distractions. Leave plenty of time to talk out questions and feelings your child may have. If you quickly read such a book—especially just before bed—your child may still have some unresolved feelings that can make sleep difficult. As you read books—not necessarily just adoption books—start with the simple. If a book has lots of words and fewer pictures, and may be more than your child can absorb, you can just pare it down. Even non-adoption books can be used to bring up feelings related to having parents, losing parents, as well as proper parental care, and being neglected. Asking questions in a calm and tender way, can help elicit thoughts and feelings from your child that he may not otherwise share. Pre-school. You can start with the Three Little Bears—a non-adoption book. There is a mommy and daddy, and baby bear. Discuss with your child what the mommy may be thinking. Ask such questions as, “Why would mommy and daddy bear want baby bear’s porridge to be ‘just right’”? Such questions can lead the child, who may have come from a difficult past, to discuss what it may be like to have little food or not to have a mommy who carefully fed her child. You could ask your child, “How do you think the mommy bear fed her little cub?” Then you, as the parent, can show your child how you may have fed her if she were your little bear. You may also discuss with your child how you are sad you could not be there to have fed her porridge when she was just a tiny little bear. Middle-School: This is a time when you address more serious and negative issues about adoption. In fact, by this time most children should know their full adoption history—regardless of how difficult their past. You may want to read one page while your child reads another page so the reading is a shared experience and feelings can be discussed. who’s been in so many foster homes she can hardly remember them all. By this time, teenagers are selecting their own books. However, issues may arise and you may feel the need to have a book that helps you with the complex conversations. One such book is Telling the Truth to Your Adopted or Foster Child, by Betsy Keefer and Jayne E. Schooler. Regardless of what books you read or even if you make up your own stories and revisit your child’s lifebook, what matters is that you consider your child’s feelings, you discuss serious topics, you are empathic and sensitive to your child’s past, and you help your child know that while the past may not have been “normal,” your child is viewed by you as a precious person who can have fulfilling and blessed future.